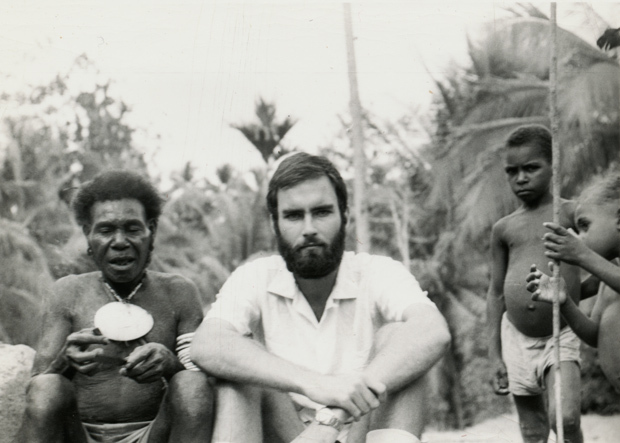 Donald Tuzin with Arapesh people of Ilahita Village during his first fieldwork in Papua New Guinea in the early 1970s. On May 1, the UC San Diego Libraries will present an exhibit of materials in Geisel Library from its world-renowned Melanesian Archive, a unique archive of materials on the people, cultures, history and languages of Papua New Guinea and other island countries of the southwestern Pacific. Papua New Guinea is considered one of the world’s most culturally, linguistically, and geographically diverse places on earth, with more than 800 languages spoken and terrain ranging from glaciers to coastal lowlands. The archive, which features the personal papers of some of the world’s most prominent anthropologists and linguists who have worked in the region, includes a variety of native art, as well as photographs, manuscripts, correspondence, sound recordings, and film and video. 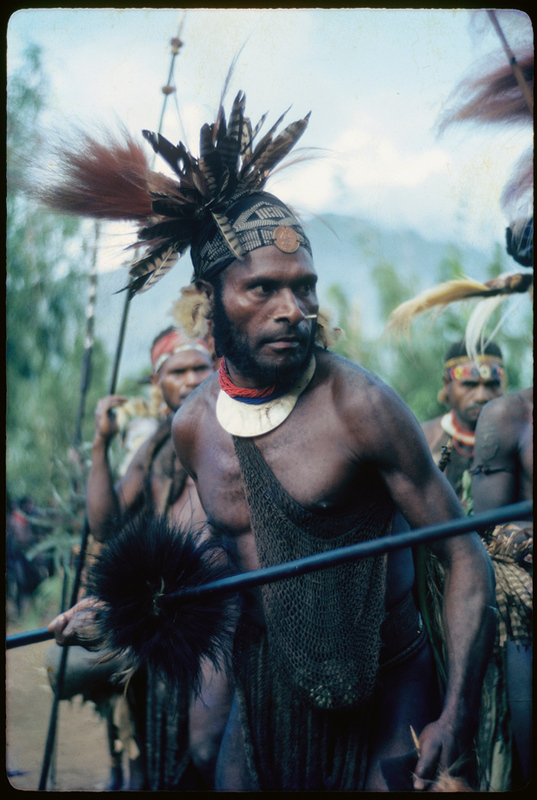 Narak man of Kwiop village, Western Highlands Province, Papua New Guinea, circa 1962. Photo by Edwin Cook. Along with the exhibit, the Libraries will hold a symposium on May 9 to mark the 30-year anniversary with the renaming of the archive for UC San Diego anthropologist Donald Tuzin. The symposium, Melanesian Anthropology: Archival Perspectives, will be held from 1 to 3:30 p.m. in the Seuss Room in Geisel Library and will be followed by a reception. The exhibit, Island Arts: Images from the Tuzin Archive for Melanesian Anthropology, will be on display through June 30, 2012. The Melanesian Archive, housed in the Mandeville Special Collections Library, was established 30 years ago by the Libraries, in collaboration with Donald Tuzin and fellow UC San Diego anthropologist Fitz John Porter Poole. In recognition of the instrumental role played by Tuzin, who died in 2007, in building and shaping the archive, the Libraries is renaming the collection the Tuzin Archive for Melanesian Anthropology. Tuzin, widely recognized as one of the leading authorities on Melanesian culture, played a leadership role on campus, serving at various times as associate chancellor, chair of the UC San Diego Academic Senate, and as chair of the Department of Anthropology. 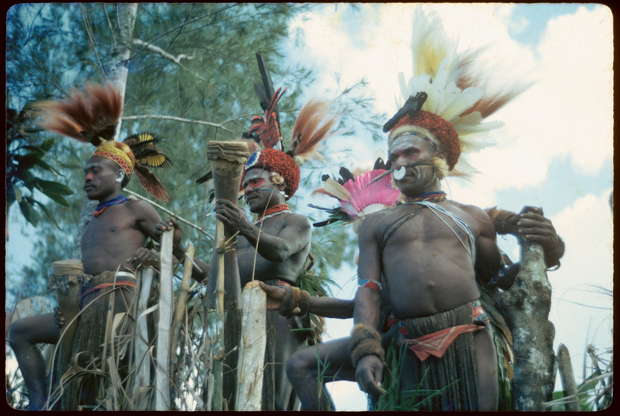 Narak men in Kwiop village, Western Highlands Province, Papua New Guinea, circa 1962. Photo by Edwin Cook. The exhibit, Island Arts: Images from the Tuzin Archive for Melanesian Anthropology, showcases a variety of photographs and artifacts highlighting the unique cultures of Melanesia. The indigenous peoples of New Guinea and other islands in the southwest Pacific are justly celebrated for their vibrant arts, which play an integral role in both everyday life and special events. The exhibit draws on photographs taken in the context of anthropological research across the region, paired with sculptures, paintings, musical instruments, and other works of traditional art. According to Kathy Creely, the Libraries’ Melanesian studies librarian since 1983, the Melanesian Archive has grown to include research materials from about 40 different anthropologists, linguists, missionaries, colonial officers, and others. It also includes photographs, films and other materials produced by scholars who have studied Melanesian cultures. In addition, the Libraries are continuing to digitize materials from the collection to enhance access. To date, some 6500 photographs from the Melanesian Archive have been digitized and are available to scholars and others over the Internet via the Libraries’ Web site: https://libraries.ucsd.edu/digital.